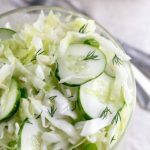 This cucumber cabbage salad is made with simple ingredients creating one fairly quick cabbage salad to put together. Cabbage, cucumbers, dill, scallions, vinegar, sugar, salt and oil is everything that goes in this salad! Easy and a quick salad to throw together! When making an oil based dressing for cabbage salads adding sugar is a must! You shouldn’t taste the sugar in your salad but I do think it helps boost the flavor some! Now you can certainly leave out the sugar and opt for a mayo and sour cream dressing instead, for a more of a”creamier” salad. Switch up the toppings by adding some sweet bell peppers or tomatoes for the cucumbers and if you don’t have green onions, just use regular sliced onions. A great way to use up cabbage with various topping options! 1. Combine the cabbage and salt in a large bowl. 2. Stir in the remaining ingredients and serve immediately. 3. To make-ahead chop and prepare the veggies; store in the fridge. Before serving, combine the salt with the cabbage first then add remaining ingredients. To make-ahead chop and prepare the veggies; store in the fridge. Before serving, combine the salt with the cabbage first then add remaining ingredients.